Garden peas are both sweet and savory. They have a grassy sweetness with an undertone of umami. Cooking fresh shelled peas can be difficult: you will want to eat them fresh out of the pod before you ever get near the stove. But if you do get to the stove, cooking shelled peas—and peas in the pod, for that matter—is short, sweet, and easy. The season for shelled garden peas—also called English peas—is short. They are grown and harvested in spring when the weather is cool. Snap peas and snow peas which are eaten pod and all can tolerate a bit of heat and last to early summer. Fresh peas should be small, bright green, tender, and sweet. The pods should look crisp. Choose peas that squeak when the pods are rubbed together. Small, young peas will have the best flavor—their sugars have not yet turned to starch. Peas are a tasty match to eggs, bacon, beef, chicken, lamb, pork, shellfish, smoked fish, white fish–and just about any other spring vegetables: asparagus, onions, carrots, parsnips, new potatoes, and the list goes on. Ratio: One pound of peas in the pod will yield one cup of shelled peas which will serve two people. You will need 3 to 4 pounds of peas in the pod to yield enough shelled peas to serve 4 people. Cooking: Peas like all vegetables are most flavorful and tasty cooked to just crisply, tender—that is slightly undercooked. Simmer young shelled peas 2 to 5 minutes. Steam young shelled peas 5 to 10 minutes. Simmering peas in water or light stock. Bring ⅛ to ½ inch of water or light stock (about ⅛ inch of liquid per pound of peas) to boiling in a medium saucepan. Add shelled peas; they should be just covered by the water. Cover the pan, and turn the heat down to low. Simmer until the peas are just tender and bright green—about 2 to 5 to 7 or 10 minutes or so, depending upon the number of peas. When the peas are just tender, drain the water if there is any left, and toss the peas with melted butter or hot cream so they are just coated. Sprinkle with chopped fresh herbs, parsley or especially mint. To this basic method of simmering peas you can also: add a pinch of sugar to give the peas extra sweetness; add two or three peas still in the pods to deepen the flavor; add a few drops of lemon juice to help preserve color. Salt peas only after they are cooked. Finish cooking simmered peas in butter. Rather than tossing peas in butter, place butter in a medium to large skillet and turn the heat to medium as you are simmering the peas as described earlier. When the butter melts, turn the heat to low and add the simmered peas to the heated butter and toss the peas until they just are coated in warm butter, 2 or 3 minutes. Add salt and pepper to taste or an herb to the peas and butter, add a clove or two of garlic minced if you like, or add a several slivers of prosciutto. Give the skillet a gentle shake occasionally, just until the peas are hot and coated with butter and seasoning. Peas can be seasoned with salt, pepper, onion, garlic, dill, marjoram, turmeric, savory, basil, chervil, cilantro, paprika, oregano, tarragon, allspice, mustard, caraway seed, sesame seed, nutmeg, mint, parsley, sage, rosemary, or thyme. Season to your taste. 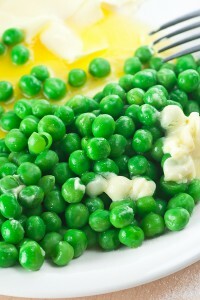 Peas can be served plain or topped with plain or flavored butter or margarine, extra virgin olive oil, vinaigrette dressing, peanut oil, sesame oil, plain or flavored mayonnaise, white sauce, melted cheese or cheese sauce, sour cream, or plain yogurt. Serve peas alone or mixed with cooked carrots, onions, potatoes, mushrooms, tomatoes, corn, celery, lettuce, sweet bell peppers, pimientos, winter squash, water chestnuts, sliced almonds, bacon, prosciutto, or ham. Melt a dab of butter in a heavy saucepan and add the shelled peas. Cover the peas with heavy cream and cook gently until the peas are tender, about 6 to 8 minutes. Just before serving, add salt and freshly ground black pepper to taste. Add finely chopped parsley or chopped mint or both if you wish. Serve immediately. Peas and carrots can be cooked and served together—a classic combination. Place shelled peas in a sauce pan and just cover with cold water then bring to just a boil over high heat; immediately lower the heat and simmer on until the peas are just tender—a few minutes. Drain well and place the peas in a serving bowl. Peel one or two medium carrots and cut into batonnet–matchstick shape, or chop into rounds or small cubes. (Don’t use so many carrots that they overwhelm the peas.) Bring salted water to a boil in a second saucepan. Add the carrots, return to a boil, reduce heat to a simmer, and simmer until tender. Drain, refresh the water, and drain again. Mix the carrots and peas together. Add a dab of butter and a pinch or two of salt and pepper to taste. Toss over heat until the vegetables are hot and coated with butter. Add parsley or the herb you prefer and toss to mix. Serve immediately. Pearl or tiny pickling onions or scallions, shallots, or leeks can be cooked and served with peas. If you choose pearl onions, blanch or parboil them in salted boiling water in advance—only 20 to 30 seconds. Drain and refresh under cold water and drain again. Peel the onions. Melt a couple of dabs of unsalted butter or warm a couple of tablespoons of extra virgin olive oil in a separate pan. Add the peeled onions or scallions and a spoonful of water and simmer several minutes or until the onions are just tender; don’t fry the onions. Add the peas and ½ cup water or so and salt lightly. Stew until the peas are just tender, about 3 or 4 minutes. Season or garnish to taste. Serve immediately. Peas and new potatoes are a flavorful spring dish. Combine small new potatoes—about 8 to 16 new potatoes to a pound, with water to cover and a dash of coarse salt in a medium-size saucepan over medium-high heat and bring to a boil; cook until the potatoes are just tender when pierced with a sharp knife or fork, about 15 minutes for a pound of potatoes. Drain away the water and return the potatoes to the saucepan along with enough cream to cover. Place the pan over medium heat and swirl the potatoes around so they are coated with the cream and the cream just starts to bubble. Reduce the heat to low, add the peas and stir. Simmer until the peas are just tender, about 2 or 3 minutes. Remove from heat, season to taste with salt and pepper. Serve immediately. Melt butter in a heavy saucepan. Add mushrooms—coarsely chopped chanterelles, shiitakes, or button mushrooms—an equal amount to the peas you plan to cook. Sauté the mushrooms until just soft. Add crème fraiche—about a cup for each pound of peas you plan to cook–and reduce by one half. Add freshly shelled peas and simmer over low heat until the peas are just tender, about 20 minutes for a pound of peas. Season to taste with salt, freshly ground black pepper, and your herb of choice; try chopped leaves of cilantro, tarragon, parsley, or mint. Any vegetables that can be simply boiled or steamed and dressed with butter are a good match to freshly shelled peas: asparagus, celery, cabbage, green or yellow beans, lima beans, cauliflower, broccoli, Brussels sprouts, beets, kohlrabi, parsnips, rutabagas, or turnips. Add any two of these to peas to prepare a medley of seasonal vegetables. Follow the cooking instructions above to prepare each vegetable. Prepare the more solid vegetables first (use the list above in inverse order); root vegetables such as beets, kohlrabi, parsnips, rutabagas, and turnips are prepared much as carrots. Less solid vegetables are prepared much as mushrooms. Prepared separately they are transferred in the final step to a serving bowl and mixed with the hot peas and tossed with butter and seasoning. Snow peas and sugar snap peas are commonly cooked in the pods. The string must be removed from sugar snap peas before they are cooked. Snap off the stem end and pull the string away easily. Steam, sauté, stir-fry, or boil snap and snow peas until the pods are tender-crisp. Taste to be sure. Serve them separately or mix them tossed with butter or sesame oil until just coated and seasoned to taste. Serve immediately.